Date of publication: February 02 2013 . If you have a lot of books or you do not know how to rationally drives the decision to improve the shelves from IKEA you both surprise and delight. Accordingly, to realize it, you may well be able to use to dispose of space and find a place for their home library and a collection of DVD or CD-ROM drive. And help us to be inspired by the example of bookstores, which are usually located such racks and racks. Go ahead and see what Home Library "With their hands" - it is not so difficult! You will need about 60 shelving system BILLY or a series of Bennu for the manufacture of wide library of about 11 4 * m and a height of 3.3 m. In such a space, it is easy to find room for a built-in office. 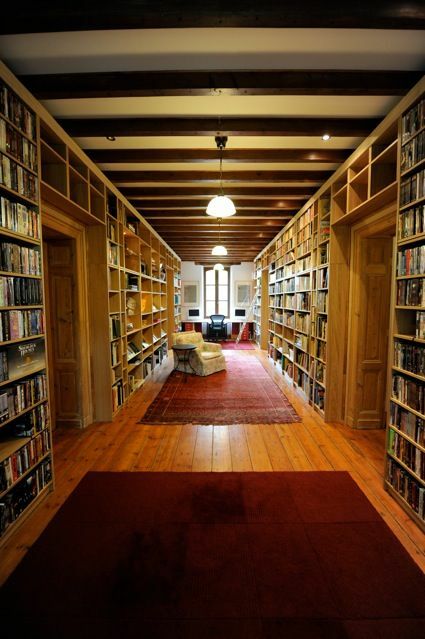 It does not matter if your room area is insufficient to establish a library of this size, just calculate how many shelves you need and create a thumbnail. After you calculate the necessary number of racks, they will need to be assembled and installed. Advantages of furniture from IKEA is that it can be turned even "upside down" and from this it becomes even more functional and unrepeatable. Perhaps in the process of working, depending on the size of the room, you will need tools, in order to cut the shelves into shelves of the required height and width. Do not forget about the fastening of the library: here, metal corners and screws will come to the rescue. In addition, fix the floor covering, for example, with slats about the size of about 39 * 66 mm, on which the structure will subsequently be attached. As a result, you will get a huge frame with shelves inside. The number of shelves can be varied, and a niche around the perimeter of the sutured gypsum board. If necessary, the shelving can be painted in color, in harmony with your interior or even equipped with a backlight. Choosing a shelf for your home library in the French style, pay attention to the fact that it can be equipped with not only the standard white shelves, but the shelves and shelves of different sizes "wood", additional shelves, top and hanging shelves, bookcase with glass door, shelves with doors and DVD-racks, use angle combination. Actual and use accessories like box with lid MAGAZINES or stop for books BILLY etc.